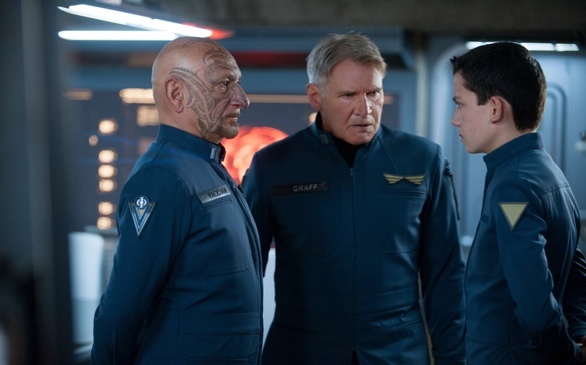 Ben Kingsley, from left, Harrison Ford and Asa Butterfield star in Ender's Game. After much anticipation, Ender’s Game is arriving in theaters Friday, and it is opening to many mixed reviews. Some critics praised the sci-fi flick, but others slammed the movie hard. Ender’s Game is an adaptation of the popular novel written by Orson Scott Card in 1985, telling the story of a young boy who is chosen because of his unparalled intellect to lead fellow soldiers in a battle that will determine Earth's future. The film’s cast includes big names such as Harrison Ford, Viola Davis, Hailee Steinfeld, Ben Kingsley, Abigail Breslin and Hugo's Asa Butterfield (as Ender). Despite all of the reviews, Ender’s Game is slated to do exceptionally well in theaters. The Hollywood Reporter said the film is in likely to win the North American box-office race this weekend with a $25 million or more opening. Ender’s Game is out in theaters everywhere, so go check it out and decide for yourself if the movie is a hit or miss. This article has been viewed 1238 times.